SF Taxi Media: New York May Ditch Taxi TVs Because They're Bothersome, And Replace Them With 'SQUARE', From San Francisco. By John Han,. News and views about San Francisco's taxi industry. 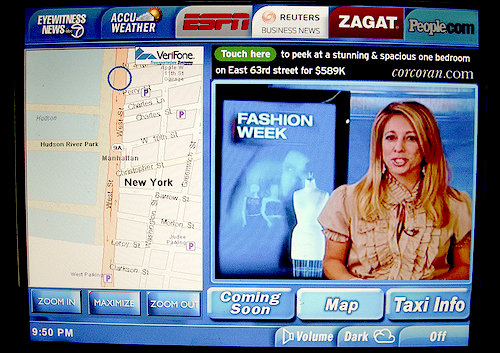 New York May Ditch Taxi TVs Because They're Bothersome, And Replace Them With 'SQUARE', From San Francisco. By John Han,. The loud, blaring Taxi TVs in New York may be so annoying to its riders, that the New York Taxi and Limousine Commission (TLC) is now expected to look at an alternative. According to a New York Times article this week, the San Francisco card processing service known as “Square”, which has gained favor amongst cab drivers in San Francisco for reasonable processing rates, (and no noise), is expected to formally present its technology to the New York TLC next month. As a pilot program, Square is proposing to replace fifty of New York's often criticized "Taxi TVs" with “similarly shaped iPads or other tablets” in the rear seats of cabs, and without the noise, according to the New York Times. Verfione Media and Creative Mobile Technologies (CMT), two companies controlling the Taxi TV market, and who have contracts with major networks like NBC and ABC to target the industry's vast and captive audiences nationwide, have blocked Square at least once before from fraying into the New York territory. But David Yassky, chairman of the TLC, told the New York Times, "Our job isn't to look out for the welfare of a particular company". In that article, he later added, "My job is to get the best product and technology available to taxis and passengers." The New York Times full story can be read HERE. 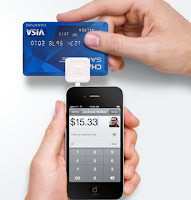 If approved, Square could enable passengers to swipe their cards from the back seat at any point in the cab ride, note their location, interact in social networking, and while some people (including this author) could think it a little silly, even play computer games. But more importantly to cab drivers, Square could challenge the dominant, taxi industry practice of 5% that companies like Verifone, CMT, and others are currently charging taxi drivers all over the country for credit card fees. Square could bring the fees down to 2.75% across the board, a rate generally considered more normal for day to day businesses. The same New York Post story published this about Square's offer to the New York TLC. "A private company has proposed a pilot program that would remove the current screens — which run a continuous loop of local news segments and commercials from TV stations — and install the tablet computers, city officials told The Post. It would be tried out in 50 cabs. “It sounds better than this,” said Orlando Morales, a cabby for two decades, as he pointed to the screen in the back of his yellow taxi. “...don't be shocked when this program gets a green light on March 1. And don't be upset! And in a February 2011 survey of 22,000 New York taxi riders, 31.3% (over one-third) said Taxi TVs are the worst part about taking a taxi. I hope that happen in SF very soon. Wish that San Francisco can get rid of 5 % fee altogether. This fee is included in our gate fee. The more and more given to the cab companies will result in demand from the drivers to increase their fare which ultimately effect the public. actions still going on in SFMTA. To report abusive comments, send email to this address: 1johnhan@earthlink.net. Opinions expressed on this site reflect the views of their authors, and don't necessarily reflect the views of the website's publisher. SF's #1 Taxi Hailing App Makes It Easier To Get Cabs. From the SF Bicycle Coalition. "Why Cab Drivers Are Poor. An Analysis of SF's Taxi Industry" By John Han. From SFMTA, Soccer Match At AT&T Park. Background photo by John Han.